A local cycling buddy of mine, Claire, had a good debut season on the women's road racing circuit last year. Not wanting to lose all the fitness she'd acquired, she decided to try out cyclo cross. This was despite her having practically zilch experience of riding off road. She worked her way through the various London League races, and after all her effort she managed to qualify for the National Cyclo Cross Championships that were held in Bradford last week. The race was tough but she acquitted herself well in this maiden appearance. Furthermore, it looks like Claire will have won the women's competition for the 2008/09 London League. This is a great testimony that with commitment and focus you can start from zero and work your way up to success. Here is Claire's story, as was published on the London Cyclesport website. Well done girl ! Maria David is a regular competitor on the cycling circuit and on behalf of LondonCycleSport.com Maria has been interviewing a number of women racers. 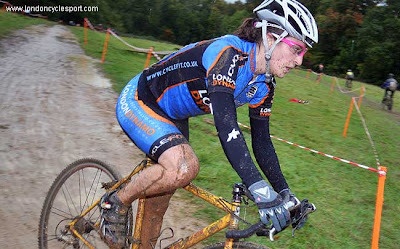 This time Maria talks to London Dynamo’s Claire Beaumont: Claire is a newcomer to cyclo cross and has successfully managed the transition from road to mud. She recaps on her season so far. Everyone I know said it’s really fun. I also wanted to keep my fitness levels up as I worked hard during the summer to get to a good level of health. Herne Hill is just down the hill from where I live so it wasn’t hard to turn up and go along. It’s a bit like wacky races. Every time you do another lap something else crops up and you learn something new or do it better. In the race I’m buzzing, trying to get round as fast I can. Scary. I went so slowly through the twisty sections at Herne Hill. I did the late summer races that were on. My second race didn’t go so well – I got a bit enthusiastic and went too fast down a descent, crashed and split my knee open – that was a quick learning exercise! Well really rather excellent but I’ve got nothing to base my performance on as this is my first go at it. I ride ‘The Roger Hammond’. Back in the early nineties Evans Cycles sponsored Roger Hammond and I now have his beaten up frame, fork and cranks. I bought all the other components for it. Maybe my bike is a lucky charm as Roger won a national champs on it. I haven’t done anything specifically. 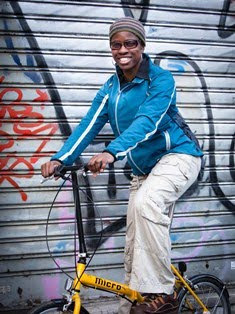 Just keep riding – riding to work I will often do 10 minutes at a hard pace, back off for 5mins recovery and then 10 minutes up at a high pace again. I try to sprint off from as many traffic lights as possible on the way to work – there are 23 sets between Croydon and Gatwick! Where have you enjoyed racing so far? Lydden Hill and Deers Leep are challenging courses which I like. Hardened rider Ben Spurrier let me in on the secret of Daz. It gets your whites white. Proof of its power is he’s still rocking a sparkling white pair of arm warmers this far into the season. I race for Surrey League in the Women’s National team series and do the Crystal Palace crits I plan to ride a couple of cyclosportives like the Tour of Flanders and the Maratona des Dolomites. So how have you found the move from nice smooth tarmac to the bumpy rough stuff? It’s quite different. Normally you’re racing in a bunch, but in cross you tend to be more out on your own passing people. I just ride hard, taking in as much sensory information as I can so as not to crash. On the road I think you’re planning a bit more. DO IT! What’s the worst that can happen? A mountain bike is totally fine to ride. It teaches you loads of new things about how to control the bike. Good Clean Fun! Glad you like the interview Toks - sounds like Elizabeth is a strong rider. Good on her. I am working through the various interviews at the moment. Elizabeth could be an interviewee for the future.